Add some sophisticated aesthetics while creating a unique sound garden with the artistic design of the Sculptural Ensemble. Effectively the ensemble has the look of a sculpture art installation, the full 6 piece collection is composed of both resonating and non-resonating styles of instruments. Each individual instrument is expertly crafted to produce beautiful tones that are easy to play and always in-tune. The recommended spacing for installation of the Contrabass Chimes is to gap the chimes at 18" and gap the mallet poles at 11" on both sides in-between the chimes. 4 total mallets with 2 mallet poles, the mallets are attached to the poles via nylon coated steel cables. The Contrabass Chimes, Lilypad Cymbals, Manta Ray, Harp, Aria and Pagoda Bells are all developed for use in outdoor environments and ready for vigorous play. Each component is secured with a holster mount to a steel posts and come standard with attached mallets. The mallets are comfortably situated to allow for multiple users to perform simultaneously together on a single instrument. 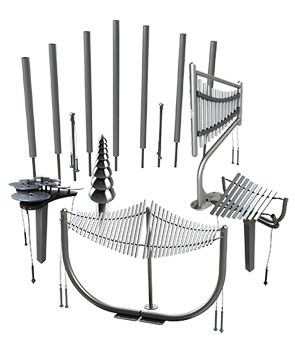 Ensembles instruments are configured for in-ground mount installation, the steel post mounts are factory cut for Adult or Toddler 'Finish Height'. The posts are ready for subgrade installations with 36" length for frost depth. Actual Post Length = Finish Height + Frost Depth. Contrabass Chimes & Manta Ray Metallophone are only available in one size.